Social consciousness, or the awareness of society, is central to the experience of being human. In order to participate as contributing members of the community and broader society, children need to learn to not only be responsible for themselves, but also for others and the environment. This social responsibility involves a deep awareness of our interdependence and interconnectedness with the entire web of life: the human, animal and natural world (Warren, 2000). Social awareness also means being aware of the problems and hardships that different societies and communities face on a day-to-day basis and having an obligation to act to benefit others (Wikipedia). 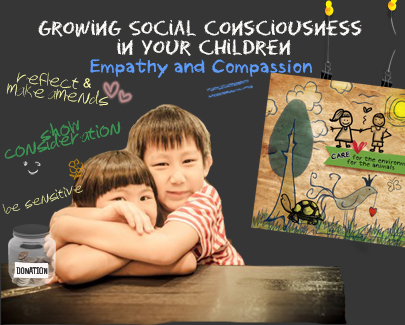 The development of social consciousness can help children discover who they are as individuals, what abilities they possess, and what part they can play in a complex and diverse world by drawing upon their strengths. Social consciousness promotes critical thinking skills and is the precursor to social change (Tsui, 2000). As fathers, you can provide opportunities for your children to learn about pertinent social and global issues and how they can contribute to the greater good through social action. This article focuses on the first domain, a social consciousness anchored in empathy and compassion for the people around us. Compassion and empathy can be understood as a kind of reverberation with the feelings of someone else (Gardiner, 1994). These values are especially important in a context where youth culture appears to be increasingly self-centred and materialistic; compassion and empathy give children the ability to connect with others and understand the presence of something greater than the self. As such, compassion and empathy are antidotes to the alienation from and antagonism towards others that many individuals encounter in contemporary society (Gardiner, 1994). Through developing these traits, children will be incited to step up to address the issues that they face both locally and globally. Teach compassion, not pity. From the outset, it is important to understand the difference between compassion and pity. Compassion is about teaching kids to feel for another by putting themselves in another’s shoes. On the other hand, pity fosters emotional detachment from the sufferer and does not compel children to get personally involved in the problem or “get their hands dirty”. Pity also creates a vantage point of “us” versus “them” and reinforces the notion the other person is inferior. Be careful with remarks such as “Oh thank goodness that’s not me” or “Wouldn’t I hate to be in a position like that”, which do not help your children see the common ground in all humanity. Draw upon everyday family life as lessons for learning. Within the home, children can learn to be sensitive to the wants, needs and interests of other family members. When a child does something that hurts or upsets their brother or sister, dads can help them to reflect on how the other person feels as a result of their actions and how they might make amends or do things differently next time. Dads can find opportunities for children to display care and concern for family members, such as when a grandparent is ill or a sibling is feeling down. Encourage interaction with diverse peers. When children interact with people who come from vastly different backgrounds, they can engage in critical debates and confront the differences between their own point of view and that of others (Piaget, 1975). They learn to develop a concern for general social issues rather than a concern with only their own world and immediate social group (Hurtado et al., 2002). Help them identify a cause or organization that they are passionate about. Compassion and passion can be mutually reinforcing. Provide children with multiple opportunities to nurture their passions through dedicating themselves to a force greater than themselves. This strategy will allow them to become active participants rather than passive observers in life. You can consider asking your children to save part of their allowance or put aside new or gently used clothing and toys to donate to an organization. Schedule family time around volunteering and community service. Research suggests that parents who act as role models and who participate in volunteering and community service have children and teens that do the same. A recent study conducted by the Corporation for National and Community Service (2005) in the USA found that teens with parents who volunteer were almost twice as likely to volunteer and nearly three times more likely to volunteer on a regular basis. These findings highlight the strong role of the family context in shaping youth attitudes and behaviours about volunteering. Live by example in daily life. Children learn effectively in concrete situations where they have live role models (Bandura, 1977). When children witness others’ actions first-hand, especially their own parents’, this has a lasting effect on them. When you as a father practise exactly what you preach, your impact on your children is much more powerful and profound. Conversely, if there is dissonance between your words and actions, children will be sceptical and less likely to take seriously the messages you espouse. Be introspective about your own behavior and mannerisms in daily life. Ask yourself honestly if you show enough consideration and caring to others, within and beyond the family. If you feel that your behavior is falling short, commit yourself to changing for the better; the positive change in your children will follow naturally. Children will learn important lessons and acquire vital social capacities to function in the larger society from their dads. With your guidance, they can be transformed from passive spectators to activists, channelling their focus and energy on solutions that could make a meaningful difference in other people’s lives. Piaget, J. (1975). The equilibrium of cognitive structures: The central problem of intellectual development. Chicago: University of Chicago Press. Hurtado, S., Engberg, M.E., Ponjuan, L. and Landreman, L. (2002). Students’ precollege preparation for participation in a diverse democracy. Research in Higher Education, 43 (2): 163-186. Tsui, L. (2000). Effects of campus culture on students’ critical thinking. The Review of Higher Education, 23 (4), 421-441.